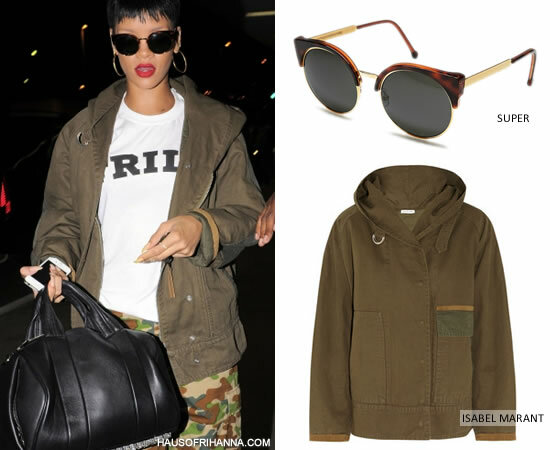 Rihanna was seen at LAX airport sporting Super‘s Lucia sunglasses. Rih is a fan of Super and this time she opted for the Ilaria Gold. The brown sunglasses feature lenses that are rimmed in gold. She also wore some favourite items including her green Isabel Marant Alan parka, A Bathing Ape camo pants and Timberland boots as well as Alexander Wang‘s Rocco handbag. Update: Rihanna is wearing Michael Agwunobi‘s Trill tee, which is available on his website.